Food systems, that is, the full set of processes, activities, infrastructure, and environment that encompass the production, distribution, waste disposal, and consumption of food, are in a state of rapid transformation in Vietnam, spurred by rising incomes and growing rates of urbanization.As food systems transform, countries find themselves in need of information to address existing and potential problems, including undernutrition, micronutrient deficiencies, overweight/obesity, but also impact on the environment. Before being able to identify appropriate interventions to ensure these transforming food systems provide people with access to healthy diets in a sustainable and acceptable way, one must first understand the views and perceptions of those who shape and influence policies around food systems. 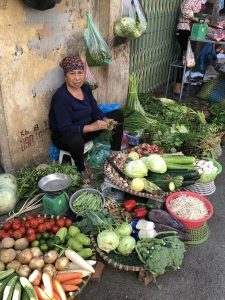 A4NH's Food Systems for Healthier Diets (FSHD) Research Flagship undertook this work in the case of Vietnam, sharing its findings in a newly released report, "Food System Policy Baseline Assessment: Report from Vietnam." The report comes alongside an integrated analysis of the Ethiopian food system, published earlier this year. Similar assessments on policy baselines will soon follow in Bangladesh and Nigeria. Together, these analyses from the different countries which FSHD has targeted as focus countries will also help inform policymakers elsewhere facing similar challenges. In conducting the analysis, researchers held interviews and surveyed policymakers and key stakeholders, including representatives from the private sector, national research and development institutions, and civil society. Topics covered in these conversations included food safety, trade, climate change, agrobiodiversity, and urbanization. Two key findings that were not necessarily surprising but highlight the relevance of engaging in such a topic were the general perception among the different key informants interviewed that the food systems in Vietnam is not necessarily delivering healthy food, and the general lack of trust in the safety of the food observed among consumers in Vietnam. "It is well known that food safety is a main concern of Vietnamese consumers and decision makers alike, especially when it comes to pesticide residues on vegetables and foodborne diseases," remarked Stef de Haan, A4NH Country Coordinator in Vietnam and an author of the report. "The lack of communication on evidence-based and systematic food safety surveillance - in combination with consumer mistrust in regulatory enforcement - do not help to distinguish perception from reality." He continued, "The food safety reality is, to a large extent, a consequence of unsustainable production practices and failures along the food supply systems. While advances have been made at the policy level, the challenge resides in implementation, enforcement, and communication towards the consumer." Listen to Stef de Haan discuss opportunities presented by Vietnam's rapidly changing food systems. The aim of this first report was therefore to provide a snapshot of the views and perceptions of policymakers and key actors in different domains directly related to food systems in Vietnam. The objective is also to use this information as a baseline, and then to compare the results of this initial analysis with the results of a similar exercise that will be undertaken toward the end of the FSHD flagship phase, or an endline assessment, in 2021. The Food Systems for Healthier Diets research flagship is led by Wageningen University and Research, in collaboration with Bioversity International, the International Center for Tropical Agriculture, the International Food Policy Research Institute, and the International Institute for Tropical Agriculture, which are A4NH Managing Partners, and the Global Alliance for Improved Nutrition. Click here for more news about work being done under this flagship. Vietnam is a focus country for A4NH research.